Ganga Lahri is a luxury hotel in haridwar, located near Har ki Pauri, provides luxurious comforts and warm hospitality that one can associate with the Prasad Heritage Group, the promoters of the heritage property of Haveli Hari Ganga in Haridwar. Ganga Lahari ensures to make your Haridwar travel a delightful experience- allowing you to relive the moments of our glorious Hindu ancestors. It is located on the banks of river Ganges close to the daily evening aarti venue at Har-Ki-Pauri. Ganga Lahari, originally built 80 years ago by the Maharaja of Tehri Garhwal, is an architectural marvel, where the ancient structure has been restored to blend the old world charm with modern day hospitality. The interiors are interestingly reminiscent of old mythological times where there are balanced tones of tranquility and comfort. 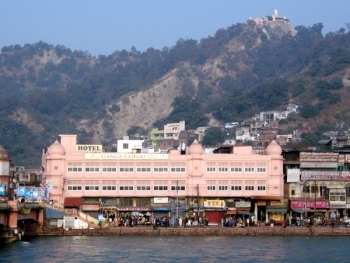 Hotel Ganga Lahari is located in busy bazaar of Kusha Ghat, close to the daily happening event Har Ki Pauri, Haridwar. It stands at the gateway to the Devbhoomi - The abode of Gods and the "Chardham Yatra". Daksha Mahadev Temple is 4 kms, Chandi Devi Temple is 3 kms, Sapt Rishi Ashram and Sapt Sarovar is 5 kms, Mansa devi temple is is 200 mts from Ganga Lahari hotel. The rooms are tastefully designed for comfort and luxury with facilities including Room service, Complimentary tea / coffee maker, Multi channel satellite television , WI FI connectivity . Culinary delights at Ganga Lahari are nothing short of an enticing experience. It serves a great variety of excellent vegetarian Continental and Indian cuisines. The emphasis is on freshness of produce and the choicest ingredients laced with the flavors from India, Southeast Asia, Europe and beyond. Get the taste of food along with the generous view of Ganges which makes your dining experience truly exotic. 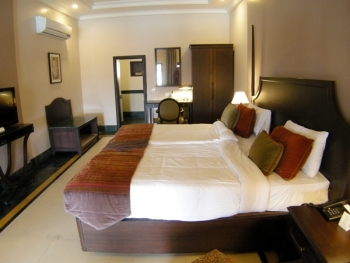 - 20% discount on Spa at Haveli Hari Ganga. - Daily Yoga/mediation session at Haveli Hari Ganga.